One of the most beautiful things about Europe is how you can hop on a train and be taken almost instantly to another world. My Eurail pass certainly got a work out in terms of long distance trips (more on that later), but even short journeys can bring you to such amazingly contrasting places. I went from Paris to Bern, Switzerland in a couple hours. I was taken from the rush of Parisian life to the quiet and quaintness of Bern. The little Swiss town proved to be a beautiful place to photograph and although the light didn’t exactly cooperate on the night I went to shoot the city, I came away with this photo which I love. There is nothing really technical involved in this shot, but I’ll explain how I took it anyways. 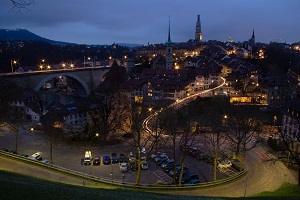 I was shooting cityscapes from well above this point when I quickly became bored with the skyline light over Bern. From the top of the hill I literally jogged down the slope with all my gear in hopes of saving as much time as I could on photo exposures. I spotted this scene out of the corner of my eye and actually deviated from my plans to shoot it. My goal was to capture the lines of the weaving road, the river and the skyline all together without making the image look too cluttered. I set up my tripod and shot the long exposure. Since I wanted to capture the street lights as stars I shot at a high f-stop. This image was taken at 18mm with a canon 60d. The camera was set at f/14 with an exposure of 30 seconds. The ISO was at 100. Great photo, Brendan. Bern looks like a beautiful city! Great piece of work there. The light balancing is good & the details are clear. The beauty of Bern caught beautifully by your lens.